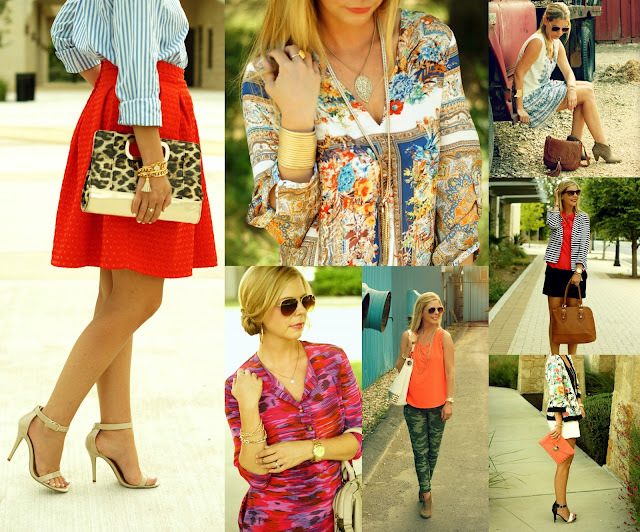 Today, I am over at Tara's blog, Mix and Match Fashion, sharing some of my favorites looks from the summer. Skip on over to see pictures of the full styles and let us know which one is your favorite. While you are there, make sure to click a round for a few minutes and take a peek at Tara's amazing style sense. I have been reading her blog for almost two years. It is one of my daily reads for inspiration. And just to add a little more substance to this post, here is a picture of my little school girls getting on the bus yesterday. Logan lost a tooth at school. Um, I didn't even know "that" tooth was loose. Landry said these exact words, "Kindergarten really isn't my thing." Oh, Lord. Yep, it's going to be a fabulous year! I promise and cross my heart that I will have an actual style post with better content tomorrow! I even have an unedited, sneak peek for you. Please don't write me off. Just because I am not hopping on a big yellow bus and sharpening #2 pencils doesn't mean I'm not adjusting to this whole back to school thing. See you bright and early tomorrow for the weekly Random Wednesday Link Up. OH EM GEE - how cute is your little Landry!? I love her comment. hahahaha "it's not my thing" oh man I love that little Landry! Your girls are so adorable. And Landry sounds like a hoot! Oh your girls! Ella wore the same dress as Logan-she felt so cool! (And she said the school day is way too long). It's an adjustment for all-including Mommy!!! Oh lololol @ Landry. That is too funny. Your girls looked great for their first day! I hope they enjoyed it. Kindergarten isn't really my thing? hahah I just died laughing. Oh my gosh, your girls are so adorable! hahaha i'm dying over the "kindergarten isn't my thing" ohhh my goodness!! Your girls are too cute! Poor Landry, I hope she can adjust to kindergarten! I can't wait to have kids for that reason, to hear the hilarious things they say! btw, what filter do you use on your pictures to get that yellow-y tint? I know a while back you told us you use ipiccy and I've been using it ever since, but I can't get that pretty tint you have on all your pictures! I'm excited for tomorrow's post! Love the detail in your dress. I also loved your post on Tara's blog. I guess I'm leaving the DINK world soon! 1) You look amazing, as always. 2) Your girls! The Kindergarten comment, I'm sure mine will say something quite similar! 3) Heading over to the other blog now, love new ones I haven't seen! Haha I love "kindergarten really isn't my thing." Your girls are precious! 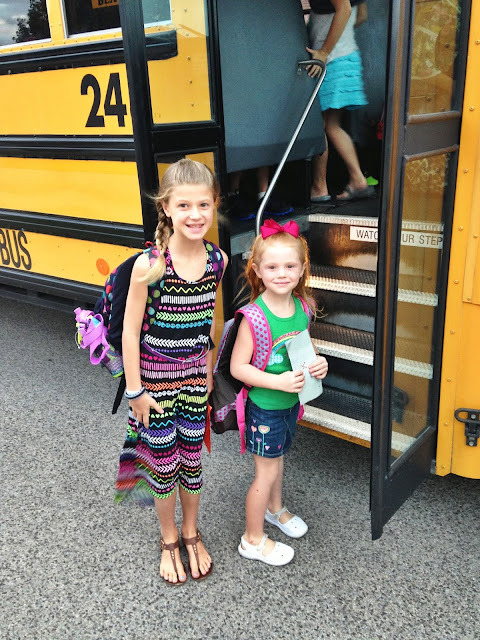 I hope they had a great first day! That's so stinkin cute. We love your blog here at Bluetique. Check out our blog www.bluetiquecheapchic.blogspot.com and our site www.bluetiquecheapchic.com. Hahah!!! Kindergarten isn't her thing...I do love your girls!! I hope my girls had the best first this day! 'Isn't my thing' hahahah I love it. LOVE the camo pants and orange top, my favorite! Hahaha, Landry's comment cracks me up! Ha, kinder isn't really MY thing either....that's why I teach the bigger kids! Haha, your children are too cute. Cute girls! So fun that they can ride the bus together! And after getting my new camera, I've been paying too much attention to photography. That unedited photo's before/after is astounding! Lightroom? Photoshop? "Kindergarten really isn't my thing"
Homegirl needs her own TWITTER. Or Tumblr. Or something. "Sparkle Monkey is NOT IMPRESSED... with kindergarten." Bahahaha "kindergarten isn't really my thing" just made my day!